He succeeded St. Anterus in the pontificate in the year 236. Eusebius relates that in an assembly of the people and clergy, held for the election of a pastor in his room, a dove, unexpectedly appearing, settled, to the great surprise of all present, on the head of St. Fabian, and that this miraculous sign united the votes of the clergy and people in promoting him, though not thought of before, as being a layman and a stranger. He governed the church sixteen years, sent St. Dionysius and other preachers into Gaul, and condemned Privatus, a broacher of a new heresy in Africa, as appears from St. Cyprian. 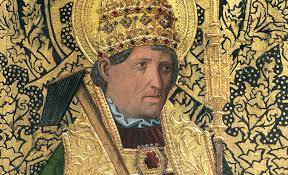 St. Fabian died a glorious martyr in the persecution of Decius, in 250, as St. Cyprian and St. Jerome witness. The former, writing to his successor, St. Cornelius, calls him an incomparable man, and says that the glory of his death had answered the purity and holiness of his life. The saints made God, and the accomplishment of his holy will, the great object of all their petitions in their prayers, and their only aim in all their actions. "God," says St. Austin, "in his promises to hear our prayers, is desirous to bestow himself upon us; if you find any thing better than him, ask it, but if you ask any thing beneath him, you put an affront upon him, and hurt yourself by preferring to him a creature which he framed: pray in the spirit and sentiment of love, in which the royal prophet said to him, 'Thou, O Lord, art my portion.' Let others choose to themselves portions among creatures; for my part, Thou are my portion, Thee alone I have chosen for my whole inheritance."